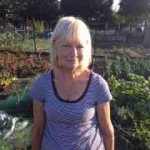 Jean is my next door neighbour at the allotment, and her full plot has often drawn admiring glances from me and other gardeners at the Bustardthorpe Community Allotments. It’s not so neat and regimented that it makes you uncomfortable, feel inadequate or wonder if they have no other life beyond brassicas, beetroot and berries; nor so neglected that you wish you had a neighbour with a bit more time on their hands. It’s just right – with a couple of rows of the bluest delphiniums that are Jean’s particular passion, and areas that are brimming with autumn raspberries and that produce basket after basket of turnips, cabbages and at least 3 types of kale. Jean is as generous with her surplus produce as she is with her time. 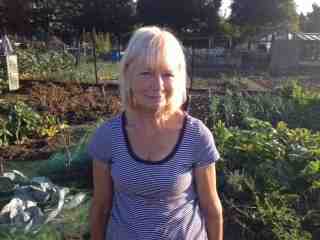 Not that allotments are Jean’s only interest. Recently she combined her love of history with her allotment work by taking part in a community history project, cataloguing sheds, and digging sample digs. “My dig didn’t reveal much at all”, she laughed, “After digging a metre square pit all I found was one shard of medieval glazed pot”. Originally from London, Jean drifted into teaching at a time when career advice for women was particularly limited, and was able to keep her love of history going through her profession as a teacher of History. She finished her 40-year career as Head of Humanities at a secondary school in North Yorkshire, six years ago at the age of 60. “I’m really lucky”, she tells me over a break for tea at the allotment; “I have my house, my teacher’s pension and most importantly, my health. And that means I have so many choices in life”. She is thoughtful for a moment, then adds, “We are the lucky generation that can finish work while we still have our health and our energy. I feel rather guilty because we are told we should be working longer, but I think, where possible, we should make way for the next generation to work and there are many young teachers entering the profession”. History is also the driving force behind Jean’s amazing travels. She usually takes 2 or 3 trips a year. 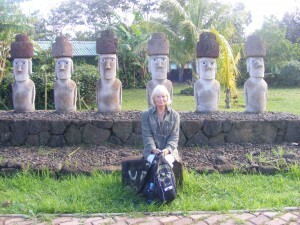 Jean is the only person I know who has visited both North Korea and Easter Island as part of her travelling life. 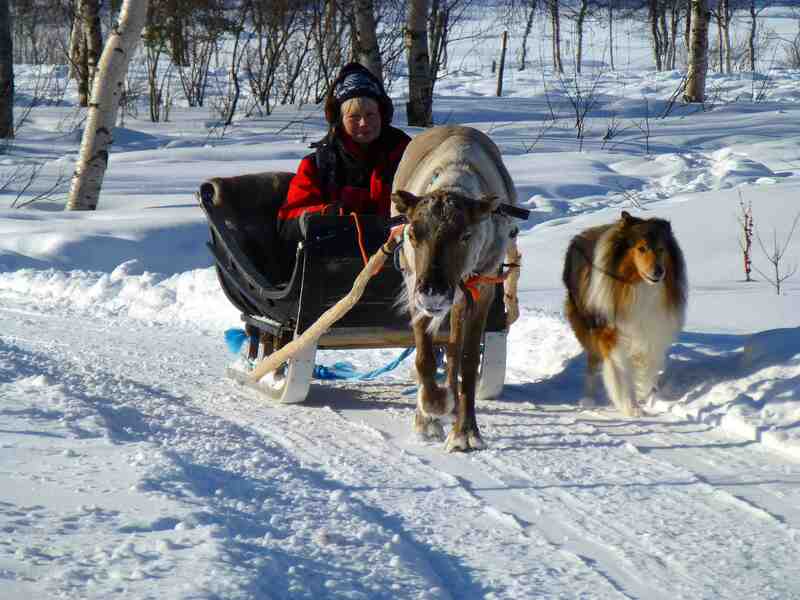 “I suppose it started the year I retired”, she tells me. “I didn’t want to be sitting at home when everyone went back to school in September, so I took myself off to the Silk Route. There was so much history to see, as well as culture and tradition. It was like stepping into a boy’s own adventure, or seeing the Great Game first hand”. Since then, Jean has also soaked herself in the history and atmosphere of Iran, Bhutan, Ukraine, Pakistan, Burma, Algeria, Laos, Central America and has travelled from west to east across South America, taking in Ecuador and the Galápagos Islands on the way. I ask Jean how she would describe this phase of her life, and she replies slowly and thoughtfully. “My partner died 5 years before I was due to retire, so I had to re-think how I would spend the time. 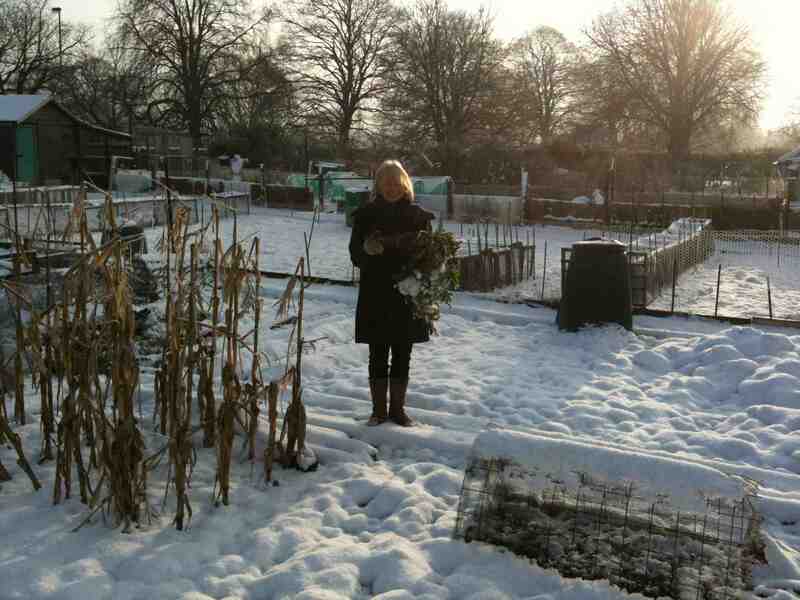 I first started working the allotment because of him. He grew vegetables and I had the plot next door for my delphiniums. After he died I knew I had to have several pegs around which to structure my week. This involved a variety of activities, often on a daily basis. I’m not particularly sociable so it gave me the discipline of getting out of the house and doing things, and always having a reason to get up early each morning”. I make the comment that Jean’s life seems to still have a number of very different pegs, as I know she works as a volunteer for both Age UK and Brunswick Organic Nursery, as well as being a member of the U3A and participating keenly in such courses as Calligraphy and Pilates, and those run by the WEA. “Actually, I’m still becoming involved in activities which aren’t as fulfilling as I hoped, but do fill time. It’s almost as if events are out of control”, she admits. “Sometimes I measure myself against other people my age and they seem more purposeful, with a more cohesive strategy in what they do. But I do finally know what I’m not interested in. I know now that I should have been bolder in sampling different activities before making such firm commitments. I do need to challenge myself more, both cerebrally and in my voluntary work. I feel I am coasting, and not fully exploiting my skills and abilities”, she tells me. I ask her what more challenge might look like. “Well I’m conscious that there is a limited amount of improvement I can make in my music because of my age and manual dexterity, but I haven’t lost the urge to really excel at something”, she tells me. “I’d like to do a small research project that stretches me intellectually, and really follow it through. However, I do know there is another phase of life to come. Retirement goes in phases and I need to make decisions about what I want to do with the next phase. You can get into thinking that retirement is an open-ended time until it isn’t, and you don’t want to start the next phase too early, but neither do you want to leave it too late when your faculties or health have deteriorated substantially”. Tea finished, Jean goes back to her digging and delphiniums.